I was in a relationship for 6 years with it ending VERY badly. We have always had problems. He put his family over me EVERY time. I had enough and broke it off. I found someone else which we were more friends than anything. Well so he came back crawling, crying asking me to marry him and it was just pitiful. Well I gave in and agreed to take him back. Not marriage though. Well that was Valentines Day. We were fine until all of sudden he started acting funny and not letting me go places I would normal go with him. Well a woman has an intuition and I had one. There was another woman. He is 27 she is 21. Well I confronted him about her and we just argued. This was all over the phone by the way. So we had words back and forth then he hung up on me. No goodbye no explanation! I haven’t heard from him since. I recently found out in September he married the girl he cheated on me with and it was confirmed. I am still VERY hurt by this and don’t know how to get past it. I hurt and think about him EVERY SINGLE day. I am in another relationship which started 9 days after my ex and I broke up in April and we are planning on getting married next year and I love him very much, but my ex is in my head. PLease help me on how to deal with this emotion. You are kind of caught between two realities — the old and the new. Of course it is often best to complete the old before you start the new. It is very difficult to move on emotionally when you are still stuck in the past. 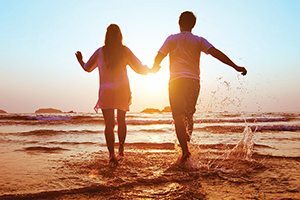 Jumping into a new relationship 9 days after a breakup, and turning it towards marriage that quickly — a recipe for problems in marriage because you are bringing along past baggage that will weigh you down and you will not feel absolutely free to expand and grow your love as time goes by. You would be best off working now with a coach or counselor to reach the emotional completion you need. There is no simple trick that a book can teach you — much less a quick response of advice. So my advice is to commit to yourself to get completion, above all else, and find a professional who can guide you through the emotional maze to get to the other side of this thing. You can do it, if you are willing to spend the time, money and effort required. You are investing in your own emotional wholeness and future access to complete happiness. ← How can I get my girlfriend back?